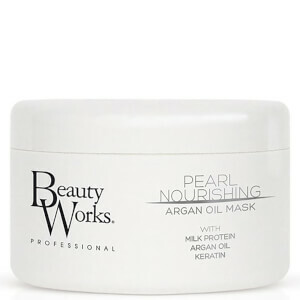 Treat your hair to Beauty Works Pearl Nourishing Argan Oil Conditioner, a revitalising blend that works to expertly nourish, repair and detangle your locks. Suitable for all hair types, the conditioner combines organic argan oil with milk protein to smoothen, moisturize and replenish every strand. Expect healthy looking hair with mirror-like shine. - K.N. Apply generously to hair after shampooing, working through the mid lengths and ends. Gently massage and comb through to ensure an even coverage. Leave for 3 minutes then rinse thoroughly with warm water. For best results use with Beauty Works Argan Oil Shampoo.